My misery is now complete. The 1999/2000 football season has rubbed my nose in it once more, and almost every pre-season aspiration I had has gone wrong. First and foremost, after a cracking start to the season the wheels fell off Town's campaign after Christmas and a faltering end to the season left us in eighth place with our only remaining interest being how many goals Marcus Stewart will score in Ipswich's play-off battle. Secondly, having suffered Bradford's promotion to the Premier League some 12 months ago (working in Bradford doubled my personal agony), I was looking forward to their early demise and restoration to the also-rans of the Nationwide League. Like a Claret and Amber Harry Houdini, they contrived to beat Liverpool on the last day of the season, wriggle out of the relegation noose and condemn us to a double visit to Selhurst Park next season. Thirdly, Grantham Town (the town of my birth and first ever visit to a football match) were relegated on goal difference from the Dr. Martens Premier division. The only slightly brighter news of the season was the promotion of Berwick Rangers (my Scottish team picked by virtue of the fact that they are English) from the Third to the Second division of the Scottish league. Manchester United winning the Premier League championship yet again tempers even this small piece of joy. 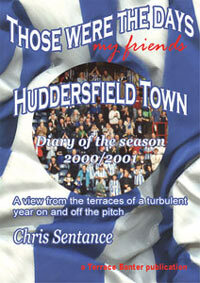 Following Town's slide from first to eighth place between December and May, many angry supporters have been busy filling column inches in the Huddersfield Examiner complaining about a season that slipped into free-fall, and blamed most of the club's woes on the untimely departure of gifted striker Marcus Stewart. Club Chairman, Ian Ayre, who promised to stand up and be counted if the club failed to achieve a top 6 placing has been busy keeping his head below the parapet and showing a complete lack of empathy with the true fans through his crass comments. No doubt he will be a little more evident in a couple of week's time when fans will be asked to part with their 'hard-earned' for season tickets.